There are many traditions associated with Oxford, but one of the best-known and much-loved annual events is May Morning. The festival occurs on the first of May and involves a crowd congregating by Magdalen tower to hear the college choir singing at 6 o’clock in the morning, before all kinds of revelry associated with the celebration of May Day break out. Despite it being an age-old tradition, much of the history of May Morning is still shrouded in considerable doubt. It is sometimes said, for example, that Magdalen College Choir has been participating in the festivities – as immortalised by Holman Hunt in 1890 – for over 500 years, but can such a claim be substantiated? This article explores what we know about the origin of this popular annual event and how it is developed over time. .
in lieu of a requiem, which, before the Reformation, was performed in the same place for the soul of Henry VII. The rectory of Slimbridge, in Gloucestershire, is charged with an annual payment of ten pounds for the performance of this service. The college had received the advowson (the right to nominate a priest) of the living in Slimbridge from Lord Berkeley in 1484 in return for daily prayers and keeping an obit for him after his death. Henry VII then inherited the estate and allowed Magdalen to keep the advowson in return for the same services to him. The college also succesfully petitioned to have £10 a year provided to them from the Slimbridge tithes. Magdalen tower was built between 1492 and 1508-9 and it is possible that some kind of May Day dedication may have occurred (the bells being installed in 1504-5). 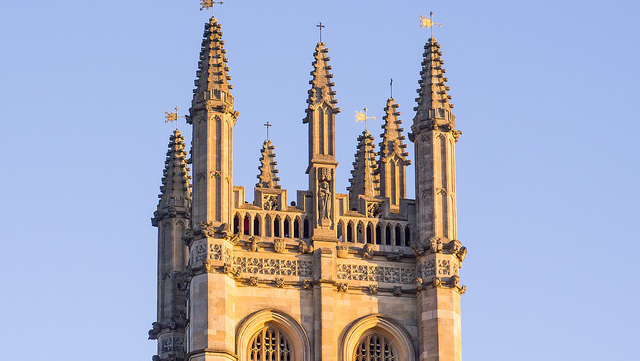 Nevertheless, the first reference to it was in the seventeenth century when Richard Parsons mentioned a £10 payment made by the Rector of Magdalen College to keep up an ancient custom of May Day of vocal and instrumental music on top of the tower. In 1688, during the college’s dispute with James II, there was also a reference to the tradition being neglected for ‘want of choristers and clerks’. In 1749, John Pointer mentioned a concert of music being held there every May-day at 4 o’clock in the morning in commemoration of Henry VII. This may well have been the kind of event that continued until the end of the eighteenth century. From the 1860s it became increasingly common for the event to be a social event attended by old scholars, many of whom wanted to ascend the tower to hear the singing. Tickets were introduced to limit the numbers, but in 1869 there were said to have been at least 200 on the tower. The hymn, Te Deum Patrem colimus, was written by organist and choirmaster (1665-86), Benjamin Rogers and was regularly used in the college as its ‘after grace’ (the words thought to be written by Thomas Smith, Fellow of the college from 1666-92). It is unclear when this was added to the ceremony. Dr Routh, President from 1791-1854, suggested it had previously been accidentally introduced, when only the choir and the organist showed up. The latter supposedly made them sing the hymn, although it wasn’t until around the 1790s that it assumed a more central role in the proceedings. One of the most influential accounts about the event came from Revd J. R. Bloxam, Fellow of Magdalen from 1835-63, who suggests that in the early eighteenth century the proceedings were rather ‘irreverent’ with unruly choristers often throwing rotten eggs down on those below. More regimented rules were then implemented in 1844, which included certain protocols, like choristers wearing surpluses. Bloxam was a tractarian who wanted to focus attention back on the religious significance of the ceremony. Although he is often credited with reviving that part of the festival, from the 1870s onwards there was more speculation about whether the event had had some pagan connections. A town or gown event? Oxford has a long history of tensions between town and gown and there was certainly a degree of antagonism between the sides when it came to May Morning. Not only was there some egg-throwing on occasion, but there was a period when the townsfolk used May horns to try and drown out the proceedings on the tower. The latter were being used from at least the eighteenth century, although it was not until the nineteenth century that they were used in a more confrontational manner. The practice appears to have been dying out by the end of the Victorian period, though, partly because the police tried to clamp down on their use. By that point, the event had become associated with other forms of revelry, like Jack-in-the-Greens, children wearing garlands – one of a variety of ways to solicit money – and companies parading decorated horse and carts around the area. Indeed, a number of newspapers commented that the widening range of pastimes connected with May Morning was testament to the growing popularity and prowess of the festival. May Morning is an event that has been enjoyed in Oxford for centuries and it is clear that it has meant different things to different people at different times. It has been hailed for its religious, pagan and even patriotic significance, but many people today are oblivious of its past and are simply happy to celebrate it as one of the many age-old local traditions. Indeed, although jumping into the Cherwell river from Magdalen Bridge was a more recent (and now outlawed) activity connected with May Morning, it will be intriguing to see how the pastimes surrounding the festival continue to evolve over time, as they remain an important part of what gives Oxford some of its charm. The main source for this article is Roy Judge’s ‘May Morning and Magdalen College, Oxford’ in Folklore, Vol. 97, No. 1 (1986), pp. 15-40.